Bangkok-based Cruise Asia Ltd. was created in 2003 for the sole purpose of providing upscale river cruise options on the inland waterways of Thailand. Although the company operates one vessel at this time -- the 20-passenger RV River Kwai, which sails the Kwai Noi River west of Bangkok -- its plans are to introduce larger boats that will explore the Mekong River from Chiang Sien, Thailand to Laos and China. Built in colonial style, the two-deck, open-air RV River Kwai takes 20 passengers along the inland Thai river from Bangkok (Kanchanaburi) to Daowadung. This is a simple vessel with elegant but basic accommodations and public spaces. The teak-lined cabins include air conditioning, safes and in-suite bathrooms with showers. All cabins are outside with outside entries, and all have twin-bed configurations. Dining is al fresco for all meals; the dining room is on the upper deck, which is covered with a collapsible awning (so the vessel can go under low bridges). The ship was built to resemble a colonial river cruiser in the style of the Irrawaddi Flotilla; by the 1920's, this Burmese company operated the largest fleet of privately-owned ships worldwide. Meals are served buffet-style. All excursions and lectures are included in the fare, with the exception of the new "elephant driving" program, which has a surcharge of 1,900 Thai Baht ($55 USD, £37). Passengers onboard this vessel will not confuse the luxury of this atypical glimpse into Southeast Asian culture and history with that of a six-star resort. Those who are looking for soft adventure with a convivial atmosphere, a great learning environment and offbeat experiences will relish these trips. Expect an international and eclectic mix of latter-day Indiana Joneses, who know that you can't get "elephant driving" lessons at your typical Ritz-Carlton or Four Seasons resort, who can leave their cell phones and laptops behind and who want to avoid CNBC and CNN for a week. 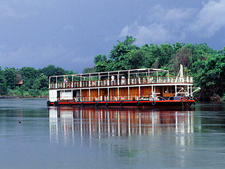 At this time, Cruise Asia Ltd. offers one riverboat, the 156-ton RV River Kwai. There are 10 simple, teak-lined twin cabins on one deck with the public area on a second deck. The public areas include a restaurant, bar, observation area and a sun deck. The boat does reverse itineraries on a seven-night schedule: Upstream from Bangkok or downstream from the Mae Khlong Dam (with bus transportation to and from Bangkok). Passengers can choose from four- or seven-night cruises; all start on Mondays. Stops include the Bridge on the River Kwai, Wat Tham Sua (tiger temple), Wat Phrasat Muang Sing (ancient Angkor temple ruins), the Thai-Burma train museum and train ride, the elephant camps and elephant rides, Lawa Cave, Hellfire Pass, Refugee School and more jungle and historic treks and Khmer history.